The alert readers amongst us will recognize this watch from an introduction article a little while ago. Back then, we were very pleased by the introduction of such a cool practical watch. 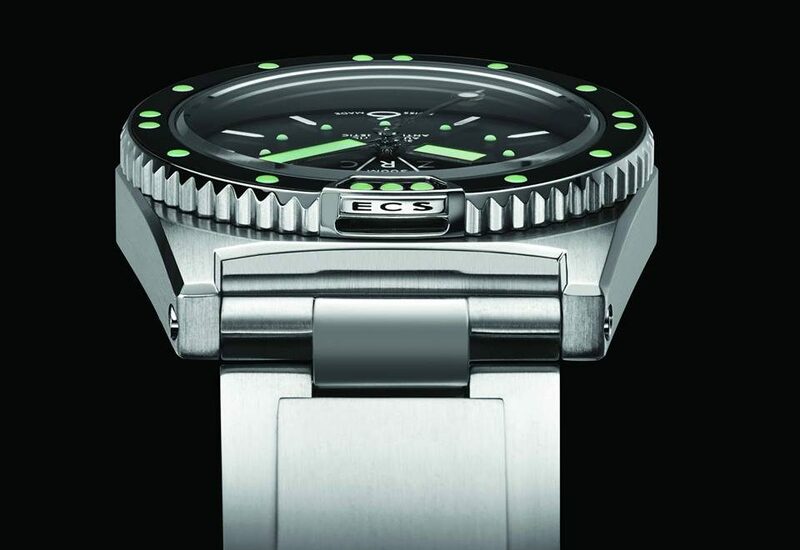 After all, the ZRC Grands Fonds 300M is a true diver. An iconic timepiece, brought back to live by a new generation behind the Zuccolo Rochet Company. I was impressed by what the brand promised then, and now – the moment is here. I got the chance to review the watch and well, I did. Of course this sounds strange; a timepiece especially made for those who look for mermaids and shipwrecks on the wrist of a Watch freak sitting behind his MacBook with an espresso. That’s what I thought, so I tried something special. 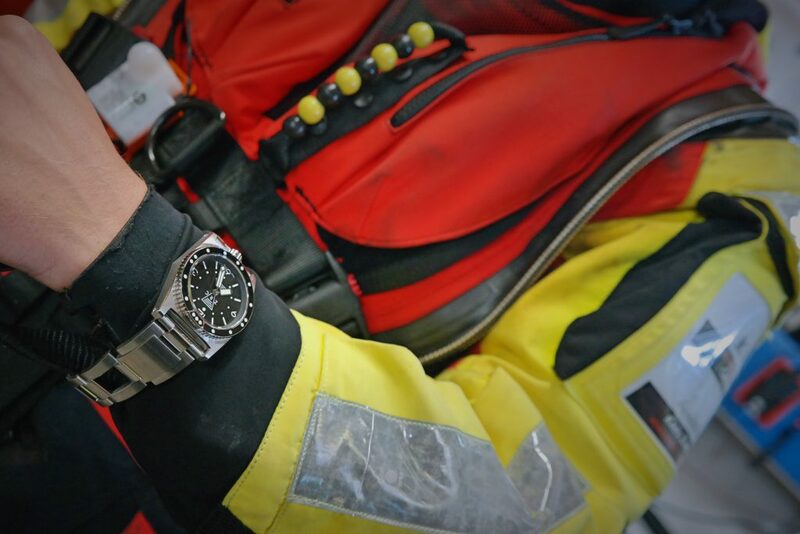 After all, the watch is made for extreme environments and professionals. I don’t know about you, but my MacBook only sees dry surroundings, the chances of getting in touch with water are close to zero. As a result of our demand, I paid the Royal Dutch Sea Rescue Institution (KNMR) a visit. 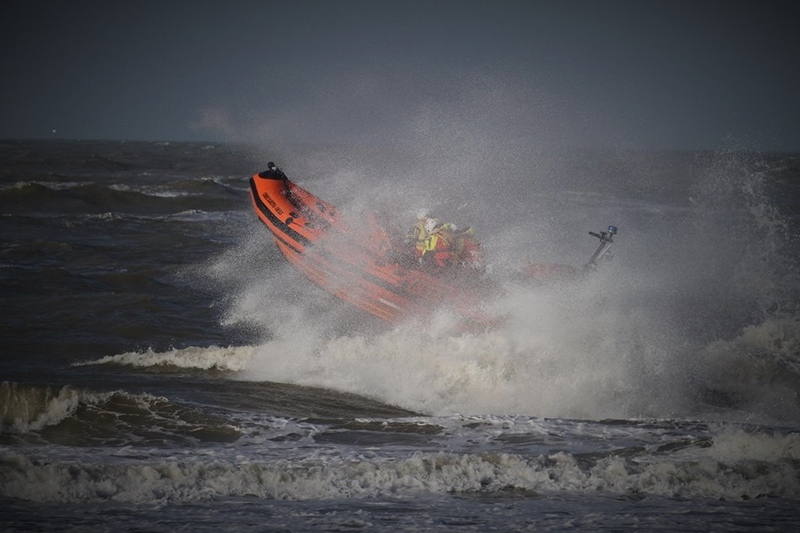 These men are built for the job and know exactly how a wet environment feels. I guess you could say that they are great company for the ZRC Grands Fonds 300M, so we can forget about that MacBook and espresso – for now. 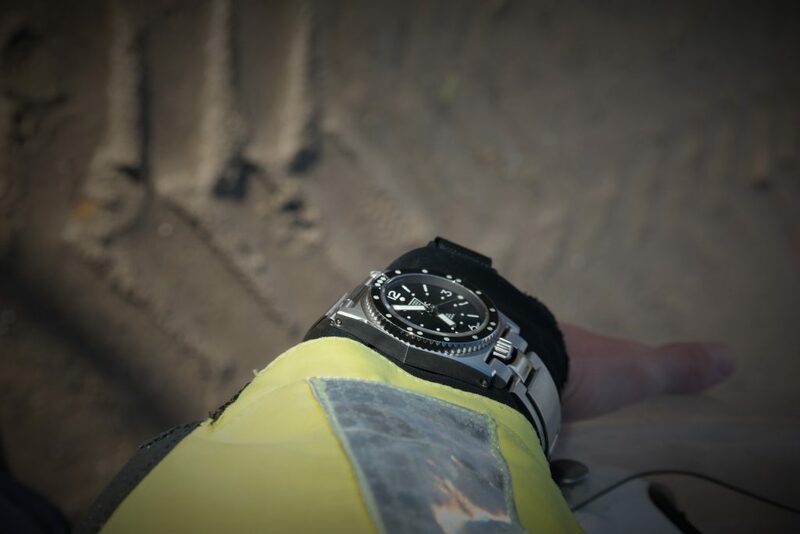 Water, salt, sand and waves – elements that can only be dealt with by true Professional Dive Watches. Not a single problem for the ZRC Grands Fonds 300M. After all, we can state that this is a legendary diver’s watch. But will it stand up to its legacy? 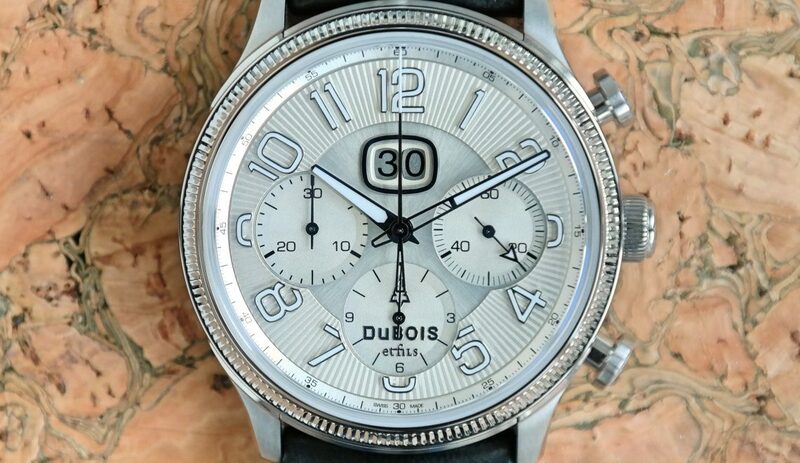 This watch breathes functionality – in my opinion, far more than any of its competitors. 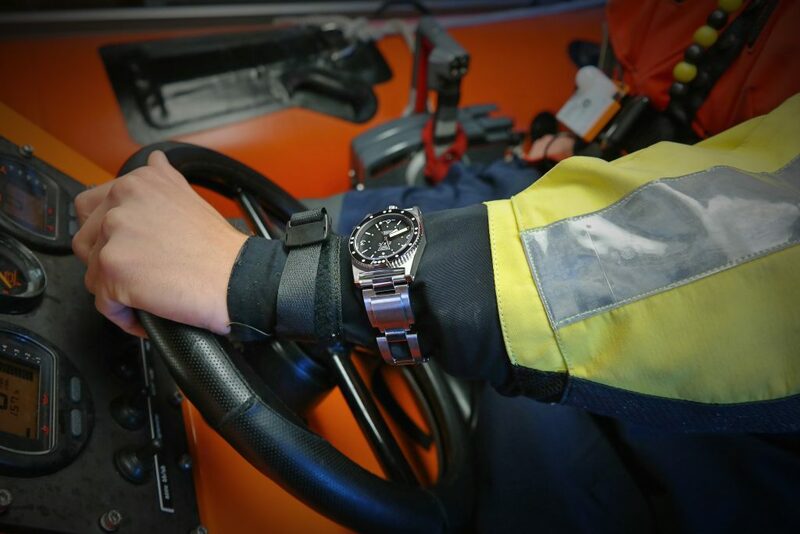 When I arrive at the KNRM headquarters – I see a lot of Caterpillar vehicles, dual motored RIBS, wetsuits and a lot of technical instruments you won’t find behind the screen of your laptop. I come to the conclusion that I’m in the right place. A place where function beats all other aspects in a split-second. When I showed the watch to the gentlemen at the scene – they weren’t very surprised. However, when I told them about the history of the watch, the functionality and its design aspects, the attention was all mine. I am very fond of the fact that the design of this watch is fully functional proof. Of course each watch has to function properly, but this one is really thought-true. This watch isn’t meant for wearing, it’s meant to be used. The easy-clean system in the bezel for instance – no problem with any salt remaining underneath the bezel hindering any movement. Or the bracelet with dive extension specially made to perfectly fit around your suit no matter what situation. 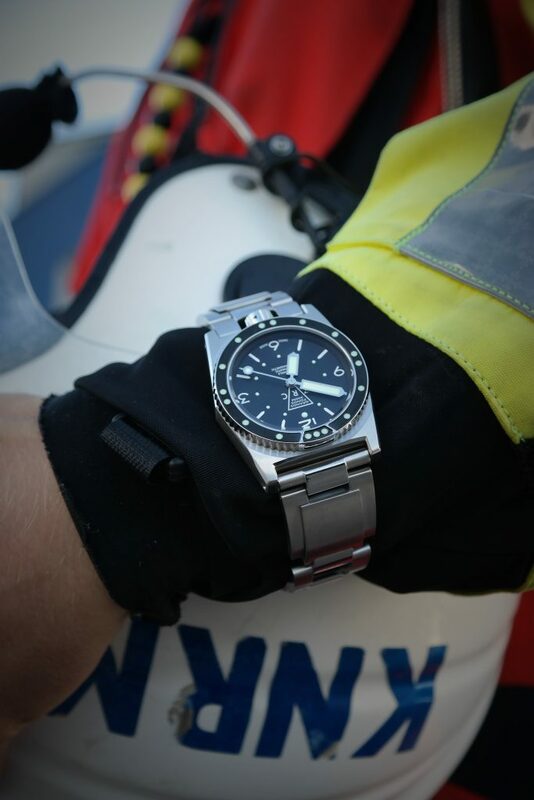 All things that are meant for the optimisation of the practical use of this diver. 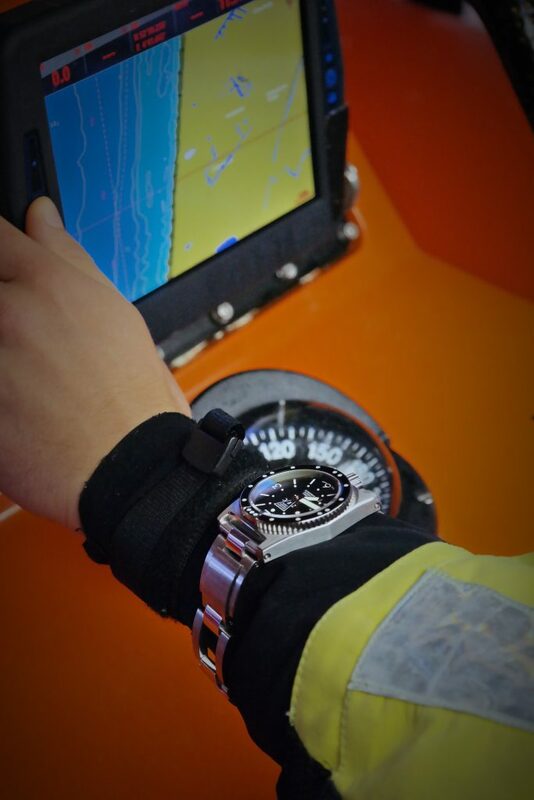 Although these features are very useful and belong to a dive watch more than any other type of watch, I do have a little point of criticism. I don’t think it’s very smart to use the clasp as it is right now. Of course I understand it’s based on the heritage of the 60’s model, but the risk of falling when opening the bracelet is much higher. I would use a bracelet with a clasp that doesn’t fully open up. Ensuring there’s almost no risk of letting the watch fall out your hands when strapping it or unstrapping it. We aren’t all as sensitive as wished for. It is a diving watch par excellence, with great diving legibility provided by its super luminous hands, its crown at 6 o’clock protected by the CPS© (Crown Protection System), Workhorse movement by ETA, unidirectional notched bezel, reverse direction winding mechanism and diver’s strap. The Grands Fonds 300 proudly asserts its original identity. A case diameter of 40.5 mm and a domed anti-reflective sapphire crystal. The addition of chamfers to the case/strap ensemble makes it very pleasant to wear. The Grands Fonds 300 is also powered by an ETA, a caliber 2824. Some people get a bad taste in their mouth when they hear the tree letters E T A. I think there’s nothing wrong with a sound movement, but it must be in balance with the price. And at this point I’m not sure if the ‘Grand Fonds 300M’ is in balance. Coming in with a consumer price of €2.990 for the steel bracelet version (GF40163). Anyhow it may not be the most spectacular movement ever, but this diver has really cool and functional additional features developed by ZRC. As I said earlier, this diver stands out and that’s definitely worth overthinking. If I say the watch is robust, I mean really robust. Even though it is a hefty piece, I think it fits well around your wrist. The brand had no intention in doing any concession to create a new version of the legendary diver. This is a true Diver, with a thick fat capital letter D. In my personal opinion, I have to admit – I wouldn’t wear it underneath a Neapolitan tailored shirt. But that’s why I love this watch. It’s a beast, a watch that will definitely start a discussion in company. A dive watch you don’t see every day. One that gets its design from the purpose it serves. Not because it looks cool or it’s trendy – no, function in its purest form. So with that in mind, I suggest one should only buy this watch after showing his PADI diving license. If you cleared that obstacle, you just have to promise me to not leave this fish on land. See you in the depths of our oceans. For more specifications about this watch, read our previous article about the ZRC Grands Fonds 300M here. We want to thank the team over at KNRM Callantsoog for their hospitality; it was our pleasure to visit.